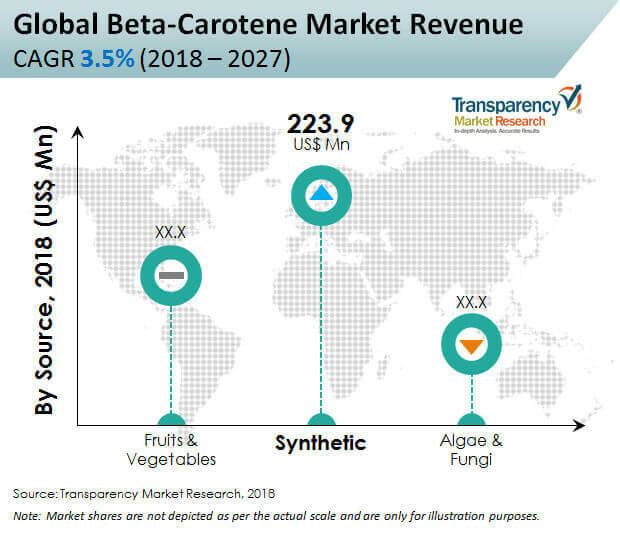 Transparency Market Research (TMR) delivers detailed insights into the global beta-carotene market, in its upcoming outlook titled, 'Beta-Carotene Market: Global Industry Analysis, Size, Share, Growth, Trends, and Forecast 2019-2027'. The global beta-carotene market is projected to register a CAGR of 3.5% in terms of value during the period of forecast, due to various factors influencing the market, regarding which, Transparency Market Research offers detailed insights. As a developing region with an increasing population of health-conscious consumers, and with increased purchasing power for processed foods and dietary supplements, Asia Pacific is experiencing a significant compound annual growth rate in the global beta-carotene market, due to the increasing consumption of processed foods containing beta-carotene, and factors such as favorable trade policies and regulations. It is anticipated that Asia Pacific would witness a significant growth rate in the beta-carotene market, accounting to 4.4% during the forecast period. On the basis of source, the microbial beta-carotene segment is expected to grow at a compound annual growth rate of 5.1% during the forecast period. Increasing consumer awareness for chemical- and synthetic-free ingredients over the years has resulted in the development of alternative sources for beta-carotene. This has fuelled the demand for beta-carotenes from microbial sources such as algae and fungi. As a chemical-free ingredient, microbial beta-carotene has substantial demand among organic manufacturers. Cellular aging is associated with the shortening of telomere. Aging results in shortening of telomere with the replication of cells due to oxidative stress, and total consumption of telomere leads to cell death. Studies are in progress to understand the role of carotenoids as antioxidants and a telomere shortening mechanism. Recent clinical studies suggest that, high blood concentration of beta-carotene and beta-cryptoxanthin show elongated telomere lengths in leukocytes. Such studies resulted in an opportunistic platform for manufacturers in applications of beta-carotene for addressing the challenges of aging. Vitamin A (retinoic acid) is a vital nutrient that is essential for vision, growth, immunity, cell division, and reproduction. It also possess antioxidant properties that prevent cells and tissues from the toxic effects of free radicals that are produced during cellular metabolism. Growing consumer awareness regarding the consumption of supplements from a variety of natural sources has fuelled the demand of beta-carotene as a vitamin A supplement, in recent years. Thus, beta-carotene has great opportunity as a vitamin A dietary supplement in developed economies. While organic farming is a convenient alternative to traditional agricultural practices, it also contributes to sustainability in terms of food safety and quality, as well as in animal and environmental welfare. Growing consumer awareness regarding the health benefits of natural and organic food has increased, owing to the associated positive effects on health, lifestyle, social convenience, and greater contribution in sustainable development. Consumers are becoming specific while purchasing products in terms of origin, manufacturing, and ingredient class. Owing to this, natural products such as beta-carotenes are giving competition to existing GMO and other synthetic food products. TMR has profiled some of the most prominent companies active in the global beta-carotene market, such as BASF SE., Koninklijke DSM N.V., Chr. Hansen A/S DDW The Colour House Corporation, Vidya Herbs Pvt Ltd., Allied Biotech Corporation, Novus International, Nutralliance is US, Vinayak Ingredients India Pvt Ltd., NOW Health Group, Inc., BioExtract, Carotech Berhad, Döhler GmbH, FMC Corporation, Archer Daniels Midland Company, ColorMaker, Inc., Penta Manufacturing Company, Food Colour Innovation S.L., Kingherbs Limited., TCI Chemicals (India) Pvt. Ltd., and others., to provide a wider view of the beta-carotene market across the world. Key global manufacturers and product developers processing beta-carotene are focused on producing naturally-derived beta-carotenes from sources such plants, vegetables, algae, and fungi, rather than synthetic ones, due to consumer preference for natural ingredients. Beta-carotene is increasingly consumed as a dietary supplement to boost vitamin A level.